One of the best parts of DVD movies are the commentaries by directors, actors, costume designers, and others involved in the creation and production of films. A few years ago, Kevin Honeycutt and I were talking about student video production and came up with the idea of a “Director’s Commentary” or an “Actors’ Commentary” video assignment. The idea is for students to watch their video together, and record the audio of their discussion reflecting on what took place, what they learned, the “backstory” they want to share about different video elements, etc. They could follow a teacher-created rubric to “cover their bases” when creating the commentary audio. While I’ve wanted to share this idea and promote it ever since, today’s the first time I’ve actually created one of these “Actors Commentary” videos. In this post, I’ll share some lessons learned and suggestions for classroom teachers. My 3 kids (who are on fall break) and I created, “Actors Commentary: The Hobbit In Five Minutes” today. 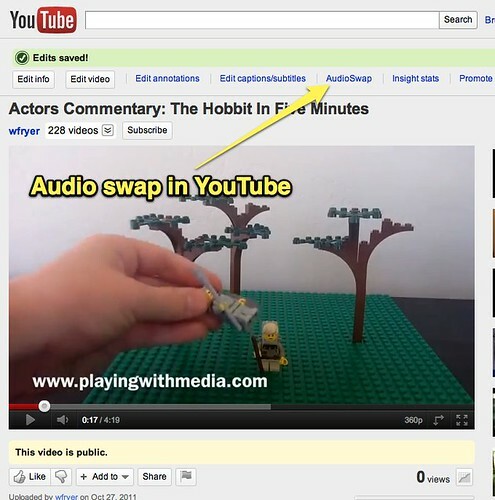 The video track of this is identical to the 4 minute, 19 second “The Hobbit In Five Minutes” project we created in July 2011, but the audio track is different. We used my Sony digital audio recorder to watch the original video together, with the computer’s audio muted. Prior to actually creating this “commentary video,” I mistakenly thought YouTube supported swapping or exchanging an audio file from MY computer in an existing video. This is NOT the case. As several contributors in this YouTube Help forum post explain, the purpose of Audio Swap in YouTube is to basically salvage a video which has been taken down because of copyright violations and permit a user to still keep it online with copyright-approved music content. The ONLY options provided for a YouTube Audio Swap are choosing pre-selected and pre-defined music clips for which YouTube has obtained licensing permission from the artists and/or recording companies. You CANNOT upload your own audio directly to an existing YouTube video and swap it out. To do this, you must use a video editing program on your computer and make the audio switch. Fortunately, iMovie software on a Mac makes this process very straightforward. I bet many readers have been reticent to embrace “the new iMovie” since Apple updated it from its timeline version (iMovie ’06) several years ago. I’ve had my doubts about the new version too, but was finally convinced the new version is better because of the realtime editing and effects features. There are three basic steps to swapping a new audio file into an existing movie you’ve created in iMovie to create a “commentary version.” I did this today with iMovie ’11. 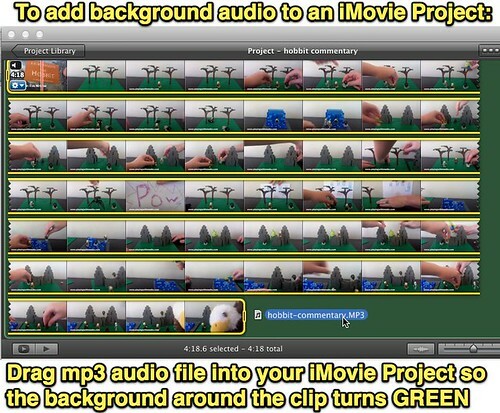 Second, drag your imported video from the Clip Library (bottom of the screen) to your project area. With the entire clip selected (double click it) choose the CLIP menu, then MUTE CLIP. It’s possible to extract the clip audio and delete it, but muting the clip works well (and with ‘minimal clicks’) for this purpose. 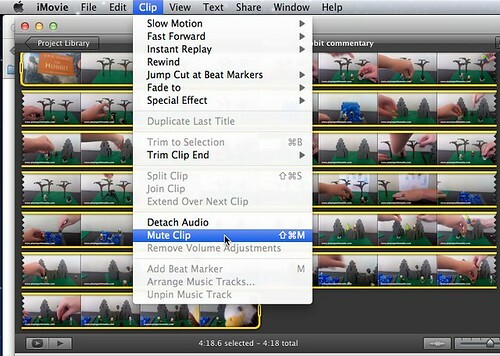 Third, drag your recorded audio file from your computer’s hard drive (your Finder) onto your iMovie project window. Make sure you drag the file as shown below, so it drops next to your video clip instead of on top of it. The entire background of the project window should turn GREEN, which means your file will import as background audio. That’s it! Now you’re ready to share / export your video and upload it to YouTube. I’ve created a new category for “Actors Commentary” videos on Share: Playing with Media, and added this example as a new post. Consider asking YOUR students to create an “Actors’ Commentary” video during the next video project they complete in your class. When they publish it, please share it using the CONTRIBUTE form on Share: Playing with Media! This was a lot of fun to do, and I’m sure our family will have fun listening to this version as well as the original in the years to come. Playing with media can be quite engaging!